If you follow me on instagram, you probably saw my post on #ASimpleYule. It's all about celebrating the season of Yule without losing sight of the sacredness of simplicity. With the chaos that 2016 has been simplicity can become a powerful tool of change. The season of Yule is the land beyond the gate of Samhain. So join me in finding the simple moments of pleasure needed to sustain us during these challenging times. Use the tag #ASimpleYule to share your festive photos, the ways you maintain your centeredness during the darkening year, and your favorite charms, recipes, and decorations and more. I can't wait to see what you share! The following tea uses only three ingredients, but is full of flavor. It also incorporates the sacred colors of the season: red, white, and green! The Goji Berries (Lycium barbarum) add natural sweetness, the Peppermint (Mentha piperita) enlivens without over-stimulating (as well as assists with digestion after a rich winter meal! ), and the Chrysanthemum (Chrysanthemum sp.) is the "snowfall" that the tea is named for. Brew 1 teaspoon per 8 ounces of water for 10 - 15 minutes. The longer it brews the sweeter it becomes as the Goji Berries infuse further into the water. Enjoy! Celebrate #ASimpleYule with more seasonal activities! Read about some of my favorite herbs of winter, create your own winter wellness apothecary or other simple herbal gifts. 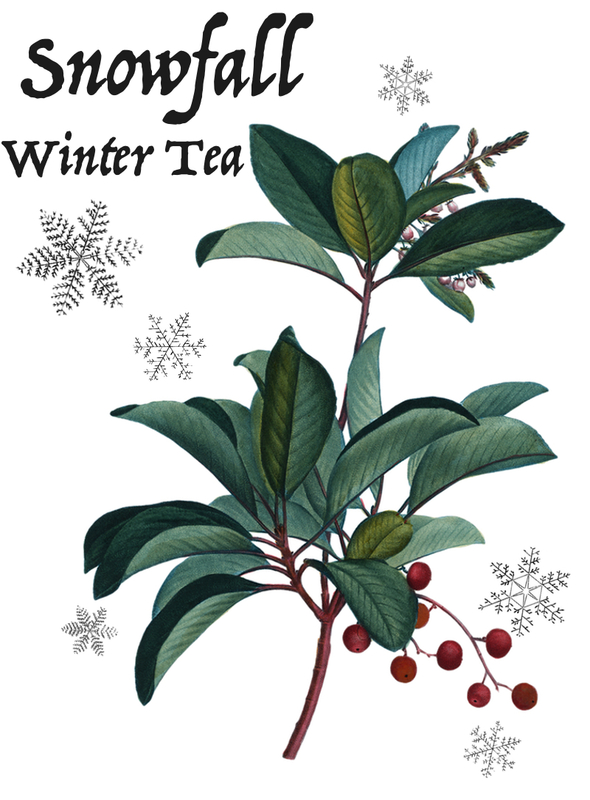 And you can enjoy more of my favorite recipes with my Winter Apothecary ebook. We respect your privacy and will not share your information with anyone or any snow person. We all have people in our lives that we can, with all sincerity, call lovely. They embody the qualities of compassion partnered with the generous concern that you are having a good day and that they are somehow contributing towards such a goal. Lovely is a tea blend to celebrate the loveliness in our lives and preferably with the ones we’ve dubbed “lovely” to share a cup with us. Lovely is our first red tea blend with a base of beautiful and naturally caffeine-free Rooibos. Super high in antioxidants, Rooibos is a fantastic herb to enjoy daily. Along with Goji Berries, Lovely is a gentle but effective adaptogenic blend that helps the body deal with stress while nourishing the kidneys and liver. ROOIBOS Aspalathus linearis: High in antioxidants (higher even than green tea!) with anti-inflammatory, antiviral, rejuvenative, and adaptogenic properties, Rooibos is wonderful. Rooibos is also useful in treating allergies, indigestion, insomnia, general nervousness, and skin complaints. Rooibos definitely keeps it lovely. GOJI BERRIES Lycium barbarum: Also known as Wolfberry, Goji Berries have a long history of use in Traditional Chinese Medicine. Nourishing to the kidneys and liver, Goji berries stregthen the blood. They are full of vitamins and minerals including vitamin C, iron, zinc, and selenium. ANISE SEED Pimpinella anisum: A great herb for indigestion and bloating, Anise seed is also useful for treating coughs and colds. COCONUT FLAKES Cocos nucifera: A sweet addition to our blend to round out the flavors, Coconuts are full of vital, delicious energy. Purchase Lovely and our many other teas at our S H O P.